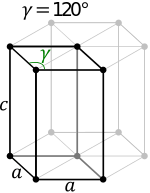 The primitive cubic system (cP) consists of one lattice point on each corner of the cube. Each atom at a lattice point is then shared equally between eight adjacent cubes, and the unit cell therefore contains in total one atom ( 1⁄8 × 8). The body-centered cubic system (cI) has one lattice point in the center of the unit cell in addition to the eight corner points. 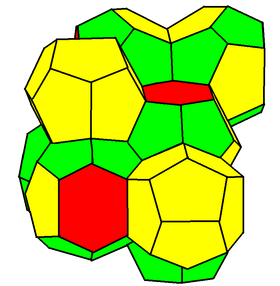 It has a net total of 2 lattice points per unit cell ( 1⁄8 × 8 + 1). The face-centered cubic system (cF) has lattice points on the faces of the cube, that each gives exactly one half contribution, in addition to the corner lattice points, giving a total of 4 lattice points per unit cell ( 1⁄8 × 8 from the corners plus 1⁄2 × 6 from the faces). Each sphere in a cF lattice has coordination number 12. As a rule, since atoms in a solid attract each other, the more tightly packed arrangements of atoms tend to be more common. (Loosely packed arrangements do occur, though, for example if the orbital hybridization demands certain bond angles.) Accordingly, the primitive-cubic structure, with especially low atomic packing factor, is rare in nature, but is found in polonium. The bcc and fcc, with their higher densities, are both quite common in nature. Examples of bcc include iron, chromium, tungsten, and niobium. Examples of fcc include aluminum, copper, gold and silver. 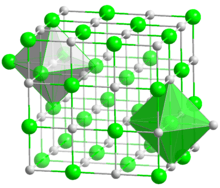 A cesium chloride unit cell. The two colors of spheres represent the two types of atoms. 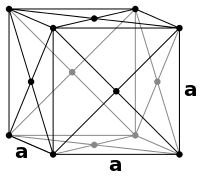 The space group of the cesium chloride (CsCl) structure is called Pm3m (in Hermann–Mauguin notation), or "221" (in the International Tables for Crystallography). The Strukturbericht designation is "B2". 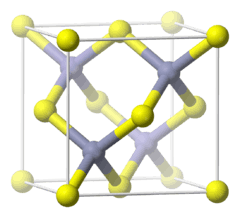 One structure is the "interpenetrating primitive cubic" structure, also called the "cesium chloride" structure. Each of the two atom types forms a separate primitive cubic lattice, with an atom of one type at the center of each cube of the other type. Altogether, the arrangement of atoms is the same as body-centered cubic, but with alternating types of atoms at the different lattice sites. (See picture here.) Alternately, one could view this lattice as a simple cubic structure with a secondary atom in its cubic void. In addition to cesium chloride itself, the structure also appears in certain other alkali halides when prepared at low temperatures or high pressures. 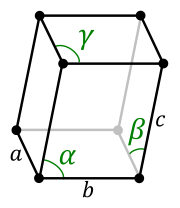 Generally, this structure is more likely to be formed from two elements whose ions are of roughly the same size (for example, ionic radius of Cs+ = 167 pm, and Cl− = 181 pm). Other compounds showing cesium chloride like structure are CsBr, CsI, high-temp RbCl, AlCo, AgZn, BeCu, MgCe, RuAl and SrTl. Other compounds showing zinc blende like structure are α-AgI, β-BN, CuBr, β-CdS, BP and BAs. ↑ The original discovery was in J. Chem. Phys. 14, 569 (1946). ↑ Sundquist, J. J.; Lin, C. C. (1981). "Electronic structure of the F centre in a sodium fluoride crystal". Journal of Physics C: Solid State Physics. 14 (32): 4797–4805. Bibcode:1981JPhC...14.4797S. doi:10.1088/0022-3719/14/32/016. ↑ Abrahams, S. C.; Bernstein, J. L. (1965). "Accuracy of an automatic diffractometer. Measurement of the sodium chloride structure factors". Acta Crystallogr. 18 (5): 926–932. doi:10.1107/S0365110X65002244. ↑ Kao, W.; Peretti, E. (1970). "The ternary subsystem Sn4As3-SnAs-SnTe". Journal of the Less Common Metals. 22: 39–50. doi:10.1016/0022-5088(70)90174-8. ↑ L. Kantorovich (2004). 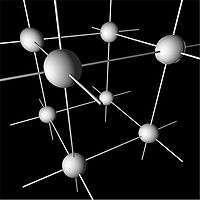 Quantum Theory of the Solid State. Springer. p. 32. ISBN 1-4020-2153-4. ↑ The Zincblende (B3) Structure Archived October 19, 2008, at the Wayback Machine.